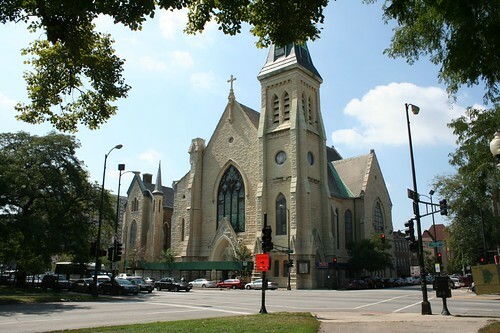 A heartfelt congratulations to the congregants of First Baptist Congregational Church on Chicago’s near west side. This venerable church was damaged in the intense blizzard that struck Chicago in February of this year. 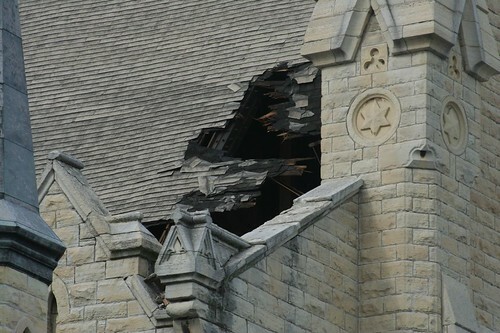 Rooftop masonry was dislodged and tumbled to the street – and through the roof, into the sanctuary. The damage to the historic building was considerable, and it was immediately boarded up. In far too many cases, this would be the beginning of a long, slow decline for such an aged church in an older city neighborhood. 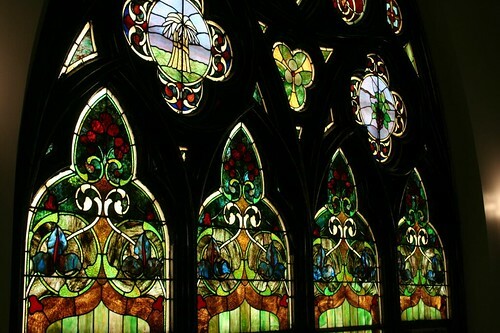 In this case, however, quite the opposite happened: insurance, bolstered by donations from an enthusiastic and sizable congregation, covered the damage and spurred additional interior work. The south size of the sanctuary is getting a new roof, a work still in progress, and the organ pipes are still out for repairs. But the bulk of the interior work is finished; and thus, this Sunday, a mere seven months after the blizzard, churchgoers returned to the sanctuary for services. And what a sanctuary it is! 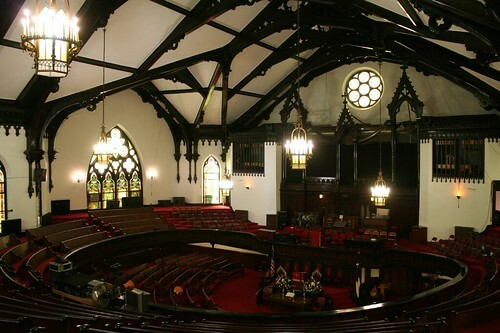 First Congregational was begun in 1869 as Union Park Congregational Baptist (architect: Gurdon P. Randall.) It opened in 1871; later that year the Great Chicago Fire burned much of the city to the east (though it never came close to the Union Park area.) Union Park Congregational housed city offices for a time in the fire’s aftermath; it would go on to have a long, storied history; in the 20th century, it has been a common stop for visiting presidents. 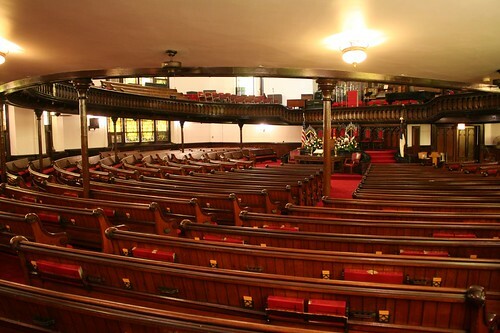 First Baptist Congregational was added to the National Register of Historic Places in 2006. Your blog is great – wonderful information and GREAT pictures – it’s a work of devotion and love and so appreciated by those of us who lived and worked in Chicago in times past. Just a word of correction (NOT criticism!) on your story about the First Baptist Congregational Church on the west side: it was originally built as the Union Park Congregational Church (not Congregational-Baptist), and – as you said – completed in 1871, housing city offices after the Great Fire. 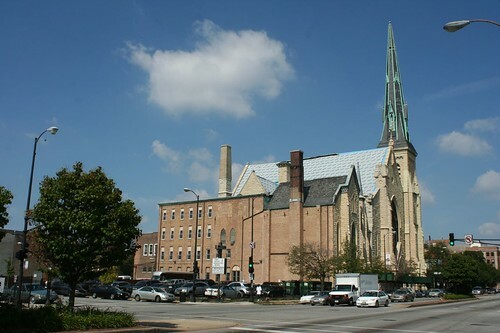 In later years, the original First Congregational Church burned, and the two congregations merged, creating the New First Congregational Church of Chicago, using the Union Park building. It was known colloquially as “New First” or just “First Church” for decades. The chapel on Ashland Avenue is old Carpenter Chapel, once the center of worship and activities for the Chicago Theological Seminary, founded there by Philo Carpenter, called “the father of congregationalism in Illinois.” There is (or should be) a white marble bust of Philo Carpenter in the Chapel, executed by Lorado Taft, who did the magnificent “Ascent of Man” sculptures in Hyde Park, and the two magnificent sculptures in the Garfield Park Conservatory. 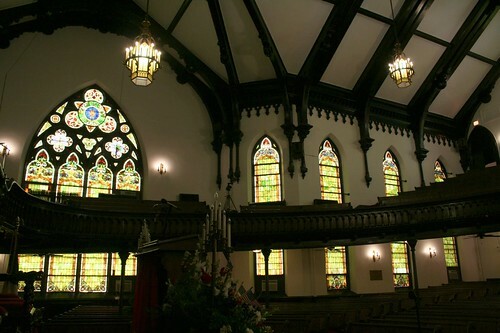 After the seminary moved to Hyde Park and the University of Chicago environs, Carpenter Chapel was then used by First Church as a venue for weddings, funerals, large “united choir” rehearsals and other activities. The building complex is – indeed – one of the rare surviving examples of the pristine elegance that graced the near west side of the city more than a century ago. Just wanted to get some of these things into the records. Please keep up your wonderful work! It’s often more appreciated than you know.